Contents: Introduction; Part I Foundations: Ethics and clinical research, Henry K Beecher; Experimentation in children: a re-examination of legal ethical principles, William J. Curran and Henry K. Beecher; Philosophical reflections on experimenting with human subjects, Hans Jonas; Clarifying the concepts of research ethics, Robert J. Levine. Part II Integrity and Misconduct: Fraud and the structure of science, William J. Broad; Misrepresentation and responsibility in medical research, Robert L. Engler, James W. Covell, Paul J. Friedman, Philip S. Kitcher and Richard M. Peters; Deception in scientific research, Patricia Woolf; Research integrity, Kenneth J. Ryan; From Baltimore to Bell Labs: reflections on 2 decades of debate about scientific misconduct, David B. Resnik; Trust and the future of research, Caroline Whitbeck; How to blow the whistle and still have a career afterwards, C.K. Gunsalus. Part III Biomedical Research: The conflict between randomized clinical trials and the therapeutic obligation, Fred Gifford; False hopes and best data: consent to research and the therapeutical misconception, Paul S. Appelbaum, Loren H. Roth, Charles W. Lidz, Paul Benson and William Winslade; Equipoise and the ethics of clinical research, Benjamin Freedman; Community equipoise and the ethics of the randomized clinical trials, Fred Gifford; Of mice but not men: problems of the randomized clinical trial, Samuel Hellman and Deborah S. Hellman; Randomized, controlled trials, observational studies, and the hierarchy of research designs, John Concato, Nirav Shah and Ralph I. Horwitz; A comparison of observational studies and randomized, controlled trials, Kjell Benson and Arthur J. Harz; Participation in biomedical research: the consent process as viewed by children, adolescents, young adults, and physicians, Elizabeth J. Susman, Lorah D. Dorn and John C. Fletcher; What makes clinical research ethical?, Ezekiel J. Emanuel, David Wendler and Christin Grady; What makes clinical research in developing countries ethical? The benchmarks of ethical research, Ezekiel J. Emanuel, David Wendler, Jack Killen and Christin Grady. Part IV Contexts of Science: The social process of science, Gerard Piel; Science as a vocation in the 1990s: the changing organizational culture of academic science, Edward J. Hackett; Fraud, ethics, and the disciplinary contexts of science and scholarship, Mary Frank Fox; Misconduct and social control in science: issues, problems, solutions, Mary Frank Fox and John M. Braxton; The role of culture in research misconduct, Mark S. Davis; Scientific societies as sentinels of responsible research conduct, Mark S. Frankel; Scientific societies and research integrity: what are they doing and how well are they doing it?, Margot Iverson, Mark S. Frankel, and Sanyin Siang. Part V Social Research: Psychology in action: some thoughts on the ethics of research: after reading Milgram's Behavioral Study of Obedience, Diana Baumrind; On the ethics of intervention in human psychological research: with special reference to the Stanford prison experiment, Philip G. Zimbardo; Learning to deceive, Thomas H. Murray; Observing abuse: professional ethics and personal morality in field research, Steven J. Taylor. Part VI Social Responsibility: The social responsibilities of scientists, Bertrand Russell; Notes of a biology-watcher: the hazards of science, Lewis Thomas; 2 aspects of scientific responsibility, John T. Edsall. Part VII Authorship and Data: Statistics and ethics in medical research, David L. DeMets; Problems in research integrity arising from misconceptions about the ownership of research, Kay L. Fields and Alan R. Price; The contributions of authors, Drummond Rennie, Annette Flanagin and Veronica York; Who did what? Authorship and contribution in 2001, Drummond Rennie; Reflections on determining authorship credit and authorship order on faculty-student collaborations, Mark A. Fine and Lawrence A. Kurdek. Part VIII Animals in Research: The rights of humans and other animals, Tom Regan; The case for the use of animals in biomedical research, Carl Cohen; Rethinking the morality of animal research, Jerrold Tannenbaum and Andrew N. Rowan; The moral status of mice, Harold A. Herzog Jr; Harry F. Harlow and animal research: reflection on the ethical paradox, John P. Gluck. Part IX Financial Conflicts of Interest: University research and the wages of commerce, Michael Davis; Understanding financial conflicts of interest, Dennis F. Thompson; Perception, reality, and the political context of conflict of interest in university-industry relationships, Mark S. Frankel; Is academic medicine for sale?, Marcia Angell; Index. 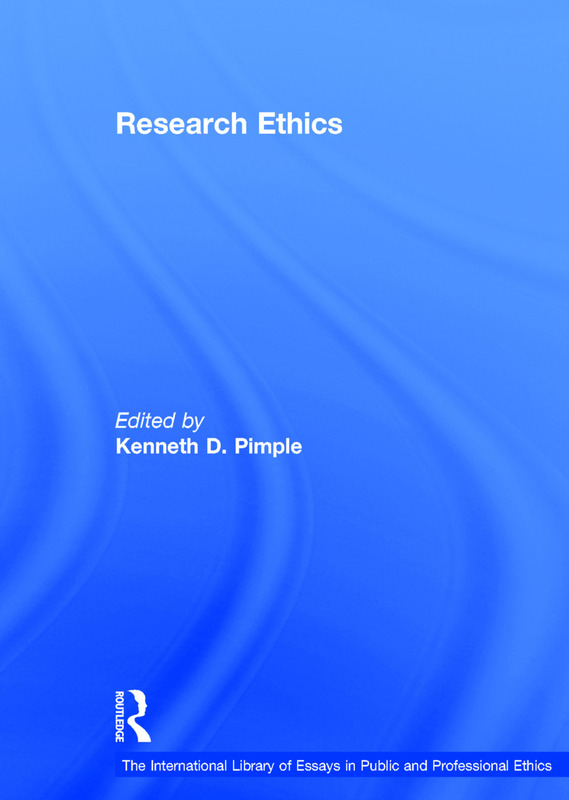 Kenneth D. Pimple, Dr and Professor, Director of Teaching Research Ethics Programs, Poynter Center for the Study of Ethics and American Institutions, Indiana University Center for Bioethics, Indiana University, USA.